A popular design choice for privacy bands through glass partition fitouts is the classic gradient fade. Many clients over the years have submitted artwork that uses this technique and as often as we see it we know that it is, without a doubt, one of the best design options for most work spaces, and here is why. Gradient fades can solve many client issues using the one design. 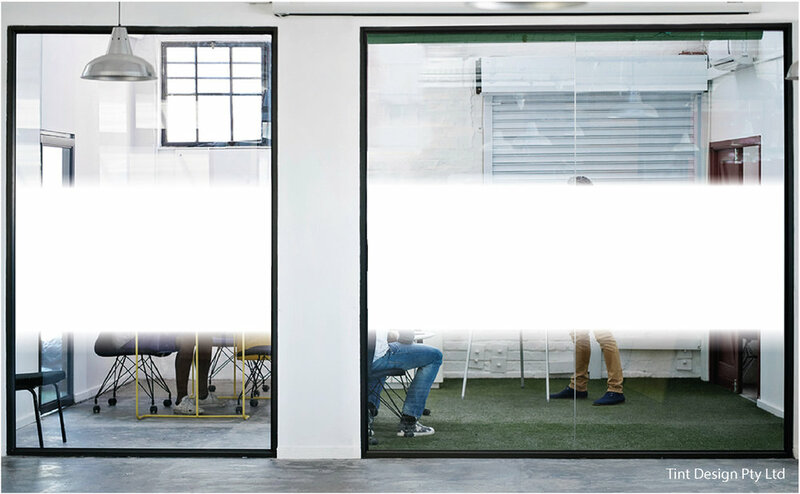 In many cases a graphic privacy band is requested throughout an office fitout to mask boardroom windows, provide office privacy or simply hide unsightly views such as office furniture. Solving one of these problems is fine but when trying to solve a number of these issues within the same space it can hinder the creative process, for example a full height solid ink graphic would solve a masking issue but be too intense in a boardroom environment. This is where a good gradient design comes into play. With the fade out starting at the correct height a gradient fade can be purposely heavier on the opacity where you need to mask a view but then fade out to optically clear in order to still allow light into a room and not make the space feel too enclosed. It also provides a softer finish at the border rather that a solid edge that a frost film band would have. The options available with gradient fades are truly endless, so to minimise the enormity of the task we’ve narrowed the option field with a small range of gradient fades to choose from however each one, as with any option in the Tint Design's Design Range, is completely customisable to suit your space and style. Contact Us for a free measure, quote and sample today!